Almost 7 million subscribers worldwide get their online roleplaying fix thanks to 1994’s Warcraft: Orcs & Humans and the smash sequel Warcraft II: Tides of Darkness. The two real-time strategy games that launched an empire and several million digital ships, but even if you alternated between defending and attacking Azeroth like it was your full-time job in the ‘90s, there are a few details about the fantasy world’s early years you might well have missed in the melee. Along with the other folks at Blizzard I exhaustively played [Dune II] during lunch breaks and after work, playing each of the three competing races to determine their strengths and weaknesses; and afterward comparing play-styles, strategies and tactics with others in the office. While the game was great fun, it suffered from several obvious defects that called out (nay, screamed) to be fixed. 3. ... AND ADDED A GAME-CHANGING MULTIPLAYER WRINKLE. 4. THIS BREAKTHROUGH WAS TRICKY SINCE THE OFFICE HAD NO NETWORK. “While I was building a game that would be playable using modems or a local area network, the company had no office LAN," Wyatt said. "So when I started collaborating with other artists and programmers, we used the ‘sneaker network,’ carrying floppy disks back and forth between offices to integrate source code revisions and artwork." 5. WHEN PRODUCTION BEGAN, THE GAME HAD NO SCRIPT. Before launching its first Warcraft title, Blizzard Entertainment—then called Silicon & Synapse—decided it needed a name with more pizzazz before marketing its big project. After considering “Chaos,” the company chose “Blizzard” as a pleasant but accurate representation of its work style. 7. THESE AREN’T YOUR GRANDMOTHER’S ORCS (NOR J.R.R. TOLKIEN’S). 8. WARCRAFT’S ART WAS INTENTIONALLY SIMILAR TO WARHAMMER’S. Wyatt explained that the Blizzard team had initially hoped to license Warhammer’s popular brand, but that, when their attempts failed, they settled on using artwork that was heavily inspired by the tabletop game series instead. 9. SOME PEOPLE THOUGHT THE INSPIRATION FLOWED THE OTHER WAY. 10. THE GAMES REFERENCE MOVIES, MUSIC, AND MONTY PYTHON (A LOT). In addition to utilizing key advances from other game series, the Blizzard team has included nods to favorite films, bands, video games, and even comics in Warcraft games starting with its first title. The Warcraft cheat codes “sally shears” and “there can only be one” recalled a character from novelist William Gibson and the fantasy film Highlander, respectively, while the Warcraft II: Tides of Darkness codes “every little thing she does” and “makeitso” gave hat tips to the band The Police and the show Star Trek: The Next Generation. 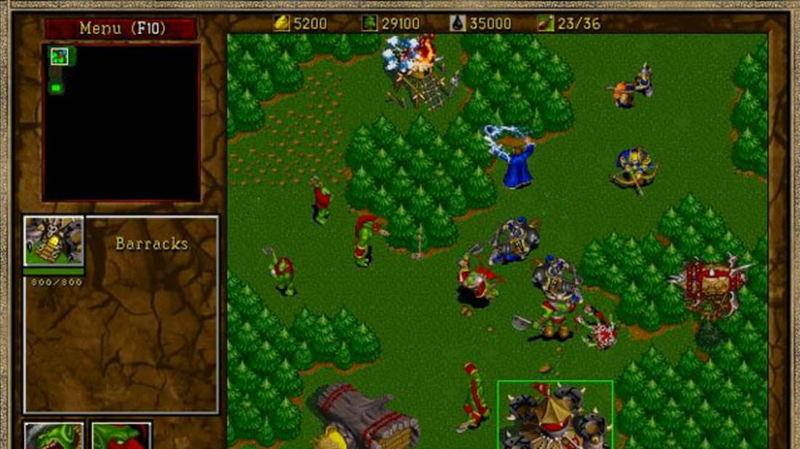 The later release Warcraft III: Reign of Chaos/The Frozen Throne takes the pop culture cake for its numerous references to songs, comics, and novels (including The Lord of the Rings) and adapted or direct quotes from over two dozen movies, including the cheat code “TheDudeAbides,” eight lines from the Star Wars films, and six from Monty Python and the Holy Grail alone. 11. ORCS HAVE THEIR OWN LANGUAGE (WITH POSSIBLE ROOTS IN TOLKIEN AND MONTY PYTHON). Fans have made guides to help decode the language of Warcraft’s famously babbling orcs and their favorite phrases, and some have compared it to the “Black Speech” tongue in Tolkien’s series. The Orcish/Common dictionary in the book clearly takes inspiration from a Monty Python skit in which a man using a faulty English/Hungarian phrasebook attempts benign statements and ends up saying dirty ones. While early Warcraft titles were memorable for their technical accomplishments, fans also kept coming back for the magically medieval game’s charm, wit, and detail. Carefully designed human and orc units got fresh if clicked on repeatedly, for example (respectively saying, “Why do you keep touching me? !” and “Stop touching meeee!”), and the fantasy world quickly filled with backstory, characterization, and wisecracks from the series’ various installations, novels, and other media. At its peak a few years ago, World of Warcraft—the series’ massively multiplayer online version, live since 2004—had 12 million players around the world, who collectively accounted for over a billion hours of gameplay. As Complex pointed out for the game’s tenth anniversary, the cultural impacts of the series’ (perhaps) final frontier are widespread and highly varied. 13. ... WHICH HAS LED TO ITS INCLUSION IN ACADEMIC CURRICULA. The first two games in the series tend not to work on modern machines, but there may be good news soon. In 2013, Blizzard production director J. Allen Brack mentioned at Blizzcon that a member of the team is working to make the first two Warcraft games accessible to fans again in some capacity, due to popular demand. 15. ... BUT LIKELY NOT BEFORE THE FILM VERSION (FINALLY) DROPS. Universal Pictures plans to release the highly anticipated film, directed by Duncan Jones, June 10, 2016 (just in time for a fierce summer season).